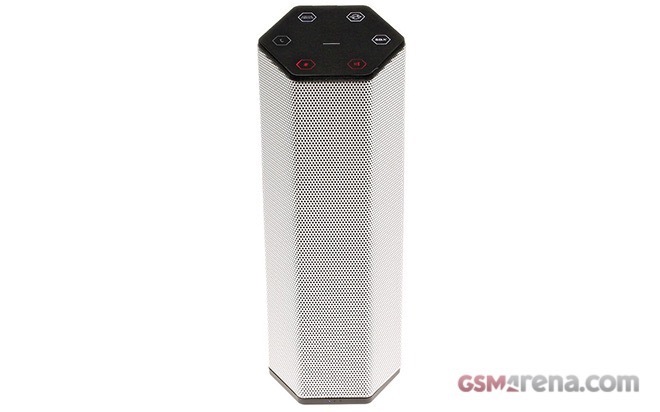 Creative Sound BlasterAxx AXX200 is another entry in the market for compact premium wireless speakers. The gadget aims to stand out from its rivals by offering an overwhelming set of additional features to its users, including the ability to act as a standalone sound card. An established player in the field of computer sound solutions, Creative Labs has focused its recent product efforts on the lucrative field of mobile audio products. Read on to find out what the Sound BlasterAxx AXX 200 is like to live with on a daily basis! Creative Sound BlasterAxx AXX200 features a duo of stacked audio drivers, arranged in a patent-pending fashion. The speaker also packs its own multi-core audio processor, designed to enhance the quality of the audio content during playback. Visually, the speaker offers a hexagonal column-like design. There’s a set of touch-sensitive controls on its slanted top, as well as another set of regular buttons for some of the additional features on its back. The speaker can connect to a device via Bluetooth 2.1, NFC, or USB 2.0. User can control the device and its features via a dedicated app, available for iOS and Android, or a desktop suite, which is available for PC or Mac. Additionally, it offers a 3.5mm audio jack and an AUX/Mic input with the same size. It can also make VoIP calls when connected to a computer. The AXX200 also packs a standalone MP3/WMA player, which can play audio files from a dedicated microSD card slot. A built-in voice recorder, megaphone functionality (no. I am not kidding here), and a karaoke feature are also on board. The retail box of the AXX200 includes a wall charger, a microUSB cable, and a couple of booklets. An optional charging dock is available to purchase separately. Connecting the speaker to a device wirelessly is straightforward. In case you want to use the Sound Blaster option on a PC, you will need to use the microUSB cable. All additional features are well laid-out and easily accessible. You might not find much use for some of them, but they are nevertheless at your service. Some of the features require you to download available apps for Android and iOS. The speaker’s main playback controls are touch-sensitive. They sit on top of it and are easy to operate. The 5,200mAh battery of the device is quoted as being capable of providing up to 15 hours of playback. In real life, depending on your usage, you will be hard-pressed to reach the manufacturer’s rating, but won’t fall too short either. The AXX 200 is a good performer on this instance. At approximately half a kilogram the AXX200 is compact and easy to carry around. The optional desktop dock makes charging convenient, but at $59.99 it is anything but cheap. Creative Sound BlasterAxx AXX 200 looks great in the flesh and is superbly put together. Its hexagonal column design is a nice departure from the norm in the segment – it helps it stand out in the crowd. The sound is well-sorted and free of distortion even at high volume. The ability to use the AXX 200 as a dedicated sound blaster is a great feature to have, especially for users to entry-level and mid-range PCs. Having a standalone audio player is a neat feature. The same goes for the ability of the AXX 200 to charge mobile devices. The sound is not as rich as what similarly priced competitors of the AXX 200 can offer. Bass in particular leaves a lot to be desired. Some of AX200’s additional features are plain silly. I would happily trade megaphone and karaoke for better sound. The optional dock is way too expensive considering that it can only be used to charge the speaker. It definitely doesn’t offer $60 worth of extra functionality. Creative Sound BlasterAxx AXX 200 cuts a fine balance between looks, portability, sound, and available functionality. The latter puts the compact speaker in a class of its own, especially considering the price range it inhibits. Speaking of money, the AXX 200 is competitively priced at $149.99 in the company’s online store. I recommend the speaker to anyone who looks for as many features as possible for their money. If quality sound is all you are after, you will find competitors that sound better for the money, but don’t rock as many bells and whitles.